Mobile Ultrasonic Inspection System "MUSE"
Sandwich components with CFRP skins and Nomex cores are attractive materials for lightweight structures. In order to inspect these components with ultrasonic imaging techniques optimizations of pulse parameters have been carried out. System components such as transducer, transmitter (pulser) and receiver had to be optimized for the application of the echo technique not only for the skin inspection but also for the whole sandwich thickness. 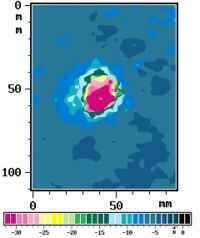 C- and B- scans show conclusively that the defects caused by impacts are mostly situated in the core. The know how of the laboratory inspections was successfully employed to in-field inspections of a specially prepared tail unit of the EH 101, the largest European helicopter produced by E.H.Industries Ltd. For B- and C- scan recordings a manual scanner was used. 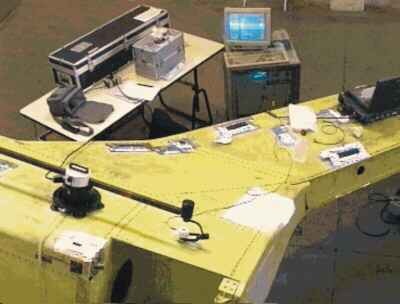 The loss of time for manual scanning is relatively high so that the MUSE-system (Mobile UltraSonic Equipment) based on PC-boards with a motor-driven manipulator for automatic scanning was developed. The water circulation system provides excellent coupling. High-performance materials such as sandwich components are attractive materials for lightweight constructions in aerospace, naval and automotive engineering. Their application to primary aircraft structures requires the knowledge of damage incurred after fa-brication or in service. Typical damages to be detected are: cracks and delaminations in the skin, debondings between skin and core and defects in the core (crushing), of which only a small part is visible from the outside. The ultrasonic technique is principally able to indicate internal defects. Honeycomb sandwich components are inhomogeneous and anisotropic materials with an extremely high sound damping. Through-transmission techniques with separate receiver and transmitter transducers on opposite sides of the component, is often used for their testing. This method is much easier than the echo technique because the sound has to travel only once in the thickness direction. However, through transmission technique is not practicable for in-field inspections because of the access is limited to one side of the components. 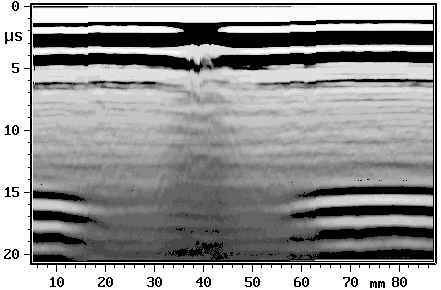 Special developments for the ultrasonic echo technique were necessary in order to obtain a high degree of evidence. This report describes the optimizations of pulse parameters for the ultrasonic imaging of internal defects in sandwich specimens with Nomex cores, and the results of laboratory and in-field inspections. Different test frequency spectra have to be used for the skin inspections and for testing of the whole sandwich thickness. The skin thickness is only 0.5 to 1.0 mm, so that high frequencies in the range of 15 to 35 MHz are required to separate interface and backwall echoes. The high frequency inspection of thin laminates are state of art at DLR . The skin inspections provide no information about core defects. Therefore the investigations concentrated to the inspection of the whole sandwich thickness by the echo technique . Best results were obtained with a broadband transducer 0.8-3 MHz with an aluminium oxide protective layer. Water split coupling was used. Different types of ultrasonic pulsers were investigated for sandwich components. Best results delivered a rectangular pulser. In comparison with the normally used broadband spike pulser (useful for high frequency ultrasonic testing of the skin) the frequency spectrum is more concentrated in a smaller range which is adjustable by the pulse width. A special pulser/receiver module for the HFUS 2000 system was developed. The adaptations to the different DAMTOS types A, D and F were carried out with different pulse widths. On the receiver side a broadband amplifier with a 0.3 MHz high pass filter and a 2.0 MHz low pass filter is used. 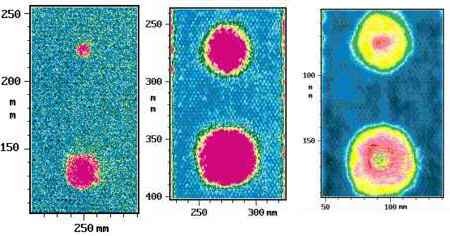 The application of the echo technique opens the possibility to a powerful ultrasonic imaging of defects in sandwich components. Specimen 39/4 with 1 mm thick CFRP fabric skins and a 15 mm thick Nomex core was impacted with energy levels of 4 and 18 Joules. Fig. 1 shows a comparison of three C-scans and their echo-dynamic curves below. The left C-scan relates to the skin (in echo-technique), the one in the centre to the whole sandwich thickness in through transmission technique and the C-scan on the right also of the whole thickness but recorded in echo-technique with one transducer. The identified defect sizes are quite different: the 18J- impact damage identified by skin inspection shows an area of 644 mm², the inspection of the whole thickness delivers areas of 2574 mm² (through-transmission technique) and 2435 mm² (echo-technique). The C-scan of the skin only shows portions of the defect areas which are equal to the sizes visible from outside. A comparison of the horizontal echo dynamic curves (whole thickness) of the 18 Joule impact indicates a -20dB drop of the amplitude (through transmission technique), and a -10 dB drop in echo technique. 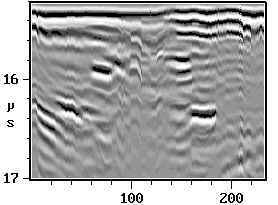 The results show that the echo technique with optimized pulse parameters provides a precise identification of defects in the skin and in the core. Additional imaging is possible with B-scans which clearly show the defects in different depths of the specimens. An example is given in Fig. 2 in the form of two B-scans. The 18 Joule impact causes many echoes in the core region which are impressively displayed in the horizontal B-scan. A tail-unit of the EH 101 helicopter was inspected at AGUSTA S.p.A. in Italy. The EH 101, the largest European-built helicopter, was developed by the British-Italian consortium E.H. Industries Ltd, which consists of Westland Helicopters Ltd. and Agusta S.p.A. This triple-engine helicopter has a maximum take-off weight of 14600 kg, a length of 22.9 m and a main rotor diameter of 18.6 m. The tail unit was manufactured from CFRP laminated skins and Nomex honeycomb-cores. The specially prepared component with impact damages and inserted teflon foils was loaded in fatigue equal to 10,000 flight hours. Fig. 3 shows the tail unit together with the DLR ultrasonic equipment, composed of an ultrasonic flaw detector HFUS 2000 and a manual 'Sinus' scanning system which was used for the C-scan recordings . The Bt-scan (B-scan over time without coordinate recording) was carried out with an ultrasonic system based on a PC-slot card (HILL-SCAN 3000 ) installed in a docking station of a notebook-PC. A typical C-scan recorded with backwall echo evaluation (of the lower skin) is shown in Fig. 4. The defect causes an amplitude decrease of about -24dB shown in the echo-dynamic curve in Fig. 4. The Bt-scans of the skin displayed in Fig. 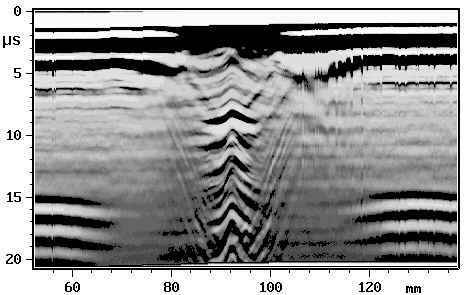 6 and 7 show echoes coming from different depths caused by impact damages. For this purpose, a 15 MHz transducer with delay line was used. The figures demonstrate that the optimizations of test parameters executed in the laboratory can also successfully applied to in-field inspections on real components. The manual scanning of the tail unit was time-consuming. One reason was the incorrect coupling in small areas so that those parts had to be inspect again. 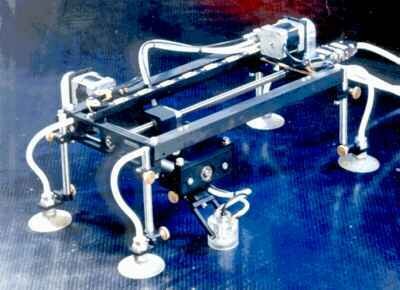 From these experiences the mobile ultrasonic inspection system "MUSE" (Mobile UltraSonic Equipment) was developed. This system consists of a PC-board based ultrasonic system built into a portable 19"-case and a motor-driven manipulation system with a water circulation system for the coupling. The manipulator is attached to the component with sucking devices. Fig. 8 shows the manipulator with transducer adapter for water circulation. The scanner accommodates an inspection area of 200 to 300 mm², a resolution of 0.020 mm and a maximum speed of 200 mm/s. The test frequency range for the MUSE is 0,05 to 35 MHz. Ultrasonic imaging is possible in A-, B-, C- and D- scans. Honeycomb sandwich components are inhomogeneous and anisotropic materials with an extremely high sound damping. The ultrasonic imaging technique for these materials must be capable of detecting all kinds of defects such as delaminations in the skin, debondings between skin and core and defects in the core (crushing). The inspections should not be limited to laboratory use, but also be practicable for field-inspections of "real" structures. In-field inspections require the application of the echo technique because the components can only accessed from one side. 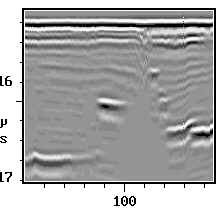 In order to solve this problem, optimizations of pulse parameters were carried out. The test frequencies for a single skin which only show minor damages have to be higher than 10 MHz in order to separate the interface and the backwall echo (0.5 to 1.0 mm thickness). The attenuation of the whole sandwich rises with increasingly higher frequencies. Therefore only frequencies below 1 MHz can pass through the whole thickness. For different types of skins (CFRP, GFRP, fabrics, and prepregs) and varying thicknesses of the Nomex cores different frequency spectra are necessary. System components such as transducer, transmitter (pulser) and receiver had to be optimized. A water-split based coupling between transducer and component was used. Inspections of sandwich components with impact damages (energy levels from 4 to 18 Joule) clearly displays defect areas in C- scans. B-scans delivered more detailed informations about the defect depths. The experiences gained by laboratory inspections were successfully employed to in-field inspections of a specially prepared tail unit of a helicopter. A manual scanner was used for the recording of C- and B- scans. Defects caused by impacts have been clearly identified with amplitude decreases of more than 15 dB. Using a manual scanning system a stable coupling of the transducer is difficult, and the scanning is time consuming as well. Therefore the MUSE-system (Mobile UltraSonic Equipment) with a motor-driven manipulator and a special water circulation system for coupling has been developed. The MUSE provides ultrasonic imaging of components with optimized pulse parameters. Hillger,W. : Ultrasonic PC- boards for different applications, 7th ECNDT 1998, Copenhagen, Conf. Proc. The author is grateful to the AGUSTA S.p.A. Company, Italy, for the opportunity to inspect the EH 101 tail unit. We also thank the European Community and all partners of the BE-DAMTOS project for the support.